Durable commercial quality all-welded steel construction combined with a quiet door closure make this cabinet the ideal choice for the office, warehouse and more. 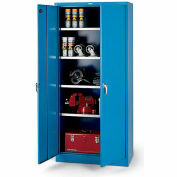 The cabinet is constructed of 24 gauge steel. The 180 lb. 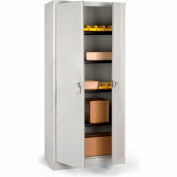 capacity shelves are made of 24 gauge steel and adjust on 2" centers. Doors include 3 sets of hinges and a full welded door stiffener to maintain door alignment and rigidity. 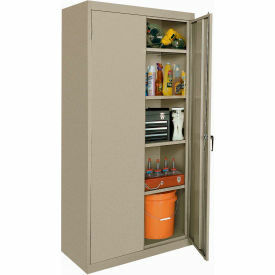 Storage cabinet closes securely with a 3 point latching system and single chrome swing handle with keyed lock. Durable powder coat finish. Shipped assembled. 5 Year Limited Warranty.